Urban heat islands threaten our health, our ability to reduce our carbon output and the very liveability of our cities. An urban heat island describes the way that urban, and increasingly also suburban areas no longer cool down overnight, causing such summer heat stress among our more physically vulnerable elderly, children and homeless people that in some Australian states the death rate from heat stress is now higher than the road toll. Today I’m talking with Steffen Lehmann who is leading a new three year research project which will identify the extent of our heat island problem, what’s causing it, and how we can change public policy and what we do ourselves to fix it. Listen to the podcast of our very interesting conversation. 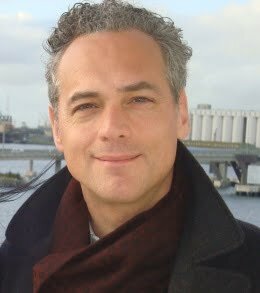 Professor Steffen Lehmann is Professor of Sustainable Design at the University of South Australia; Director of sd+b Centre; Director of the China-Australia Centre for Sustainable Urban Development (an international research centre located at UniSA and Tianjin University, China); and Executive Director (and Research Chair) of the Zero Waste Research Centre for Sustainable Design and Behaviour. 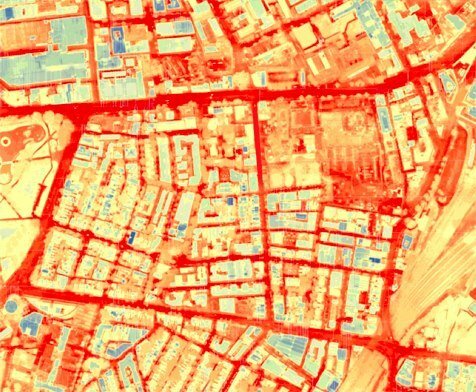 This thermal city map shows why we need street trees to combat the heat island effect. Dark red = over 33 degrees C (92F) through to pale green = 27C (80F). The hottest roads are mostly east-west but all reradiate heat all night. And it’s easy to see which buildings have the dark coloured roofs. My conversation with Steffen Lehmann came about through our mutual support for 202020 Vision.